Vitamin E is a fat-soluble vitamin with potent antioxidant properties. It helps to rejuvenate the cells of our body, in turn promoting proper blood circulation, improving immunity, protecting our cells against diseases, and maintaining glowing skin and shiny hair! Think of what makes your skin look old? Scars, wrinkles, dryness, vitamin E fights against all these signs of ageing. It boosts collagen, which is essential to provide our skin with elasticity. It also has the power to fight free radicals produced in our body due to stress, pollution and solar radiation. Having a variety of good food sources is definitely the best way to top up on Vitamin E rich recipes for glowing skin. The major sources include spinach, kale, wheat germ, broccoli, peanuts, almonds, sunflower seeds etc. Along with the consumption of these, you can also apply Vitamin E oil on the face if your dermatologist advices you to do so. Fortunately, it is easy to meet the Vitamin E requirements of our body, because there are lots of foods rich in this nutrient. You can have these plain, or incorporate them into tasty recipes. Here we present you lots of interesting recipes, which will make it fun to include Vitamin E in your diet! 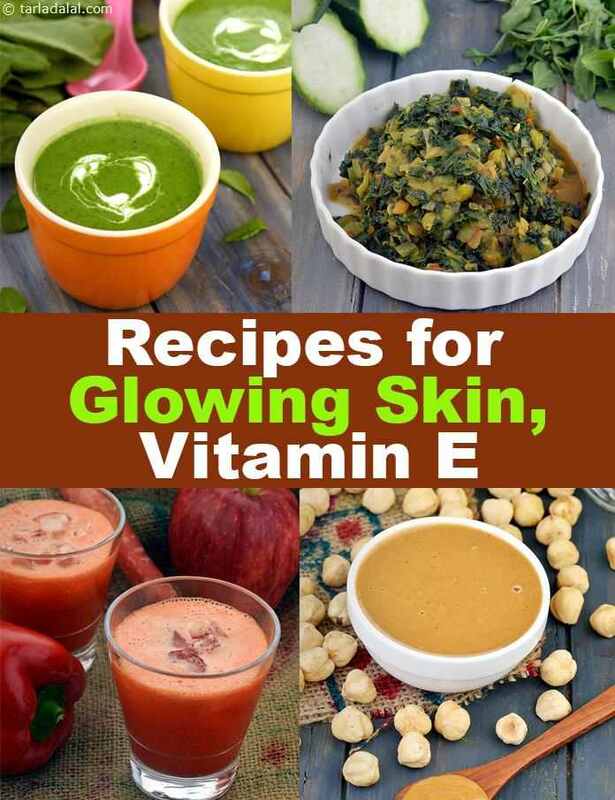 If you like the Vitamin E Rich Recipes for Glowing Skin article, then you will like the other articles of Vitamin E.
Enjoy our Vitamin K Diet, Vitamin K Recipes and other Vitamin recipe articles below.